Preparatory work in connection with the barrages commenced in December 1934, with the transfer of plant and materials from the locks up-river to Goolwa where actual construction operations began in June 1935. The bottom stop-logs were placed in the Goolwa channel by the 24th December 1939, and the whole system was finally closed up by 5th February 1940. The barrages, which have been constructed in the vicinity of the River Murray mouth, are commonly known as the Goolwa Barrages, and consist of five separate structures with connecting roadways across Ewe Island and Tauwitchere Island. The main purpose of the barrages at the Murray mouth is to maintain the freshness of the River Murray as far downstream as Wellington. This is an obligation under the Act; and to keep the water at a sufficiently high level to permit the watering by gravitation of the various reclamation areas between Mannum and Wellington. In addition to this, it will prevent the ingress of salt water from the sea during periods of low river, and will help maintain the freshness of the water in Lakes Alexandrina and Albert. Thus ensuring the productivity of the surrounding areas which would otherwise be injuriously affected by salt water after long periods of salinity in the lakes. The works have all been constructed some distance from the sea to minimize the risk of damage during heavy storms which frequently occur along this coast. At the same time they have been kept down-stream out of the line of any possible ship canal between Goolwa and Victor Harbour, so as not to interfere with any such work should it be found desirable to develop a Murray port or a river outlet for shipping at some future date. Approximately 485 hectares of Sir Richard's Peninsula have been resumed with a view to preventing sand-drift from the peninsula entering the river between the barrages and the mouth. Extensive areas which have hitherto been sandhills subject to drift have been planted with Marram grass, Pip grass, and bushy shrubs. It is also intended to keep stock off the reserve, and by these means it is hoped to eliminate the drift in a few years. The conditions governing the design of the barrage usually require the structure to withstand the water pressure from one side only, but the River Murray barrages are unique in this respect, as they are required to withstand pressure from both sides. This is brought about by the fact that they are in tidal waters, and it is possible for the tide to rise above the level of the lakes, with the result that at periods of high tide the structures will prevent ingress of salt water to the lakes, and at other times retain the fresh water in the lakes. They are also required to allow a flood to pass without raising flood levels in the lower river. 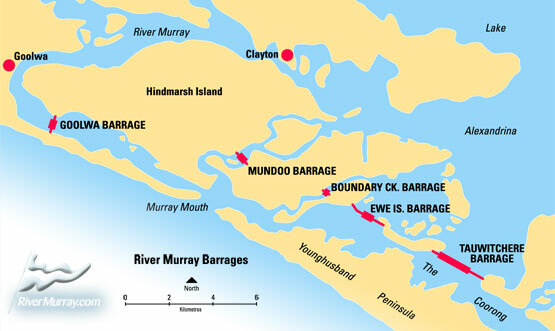 The barrages actually span the Goolwa, Mundoo, Boundary Creek, Ewe Island and Tauwitchere channels, and each structure is designed to suit the particular foundation conditions at the respective sites, and as far as practicable permit the exchange of movable parts. The first three structures are intended to regulate the level in Lake Alexandrina by means of the stoplogs in the sluiceway, whereas the remaining two will be closed except during floods or period of high river. The designs for the various structures were prepared by officers of the Engineering and Water Supply Department under the supervision of the former Engineer-in-Chief, Mr. J.H.O. Eaton, and then Engineer-in-Chief, Mr. H.T.M Angwin, and subsequently approved by the River Murray Commission (Now Murray Darling Basin Commission). This barrage, which is 632 metres long, comprises the most important section of the work and was carried out in two separate cofferdams. A factor contributing to the relatively high cost is the greater depth of water in this channel, which takes approximatley 70 percent of the river flow. The foundations are in fine sand and silt into which 4,770 wooden piles up to 12 metres in length were driven to support the superstructure. These foundation piles are driven on a batter to provide a factor of safety against overturning, and a line of interlocking steel sheet-piling 12 to 14 metres in depth was driven along the centre line for the full length to prevent water leaking under the structure. On top of these piles, a concrete floor, varying from 9 to 12 metres in width and 1 metre in thickness has been placed. This in turn supports a series of concrete piers, 122 in number, with vertical grooves to receive the specially designed stop-logs which can be placed in position or removed as required. A lock chamber 30 by 6 metres is provided to pass fishing and pleasure boats, and a specially designed navigable pass has been constructed for larger vessels such as river steams, if required. As a protection against scour, substantial stone protection is provided on each side of the structure. The movable portions will be operated with a travelling crane on a trackway over the structure. To cross the lock, a bridge is in place. This barrage is similar in design and construction to that at Mundoo, and is also founded on a sandstone reef. The total length is 243 metres. The connecting link between Boundary Creek and Ewe Island barrages is a roadway 853 metres in length across Ewe Island, the crown of which is at pool level in the lake. During high floods, this island is inundated and the road will be submerged. In both the Ewe Island and Tauwitchere channels, there are wide expanses of shallow water and the line selected for the barrages in both channels follows a sandstone reef, which provides suitable foundations and resistance to scour. 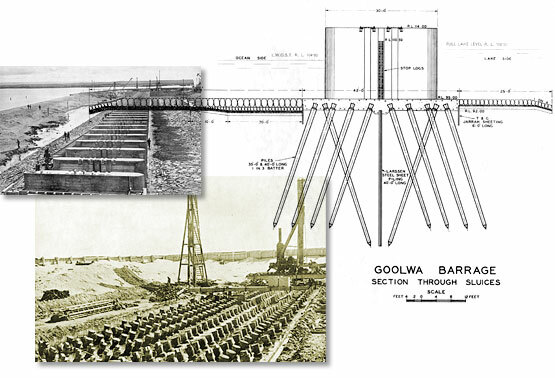 A variation in design from that of the Goolwa and Mundoo barrages was necessary so that a large number of openings could be operated by a small staff in a comparatively short time. The structure is not designed for fine regulation of the level of the lake, as the gates will mostly be closed or fully open, the latter condition applying during periods of flood or high river. The barrage is build partly on earthen embankment protected by stone paving and partly of concrete sluices. In the latter section, a concrete slat 13.4 metres in width with cut-off walls, is built on the rock, and piers at 4.2 metre centres have been erected to carry the track for the operating crane and the hinges for the gates. The type of gate selected, of which 111 are used, is known as the Taintor Radial Gate and an all steel welded design was adopted. The hinges are build into the concrete piers, and when in position the bottom edge of the gate rests on the concrete floor, the water seal on both sides and on the bottom being made with flexible rubber strips. 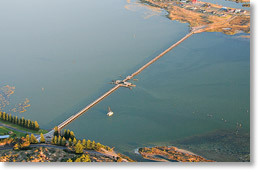 The total length of the barrage is 2.2 kilometres. A roadway across Tauwitchere Island, 1.7 kilometres in length, which will be submerged during high floods, connects this barrage with the Ewe Island barrage. The general design is similar to that of the barrage at the Ewe Island channel, but it is much larger work and ranks second in that respect to the main structure at Goolwa. The total length of this barrage is 3.6 kilometres, which includes 1.3 kilometres of concrete work on which 322 Taintor gates have been installed. A lock 13 metres by 3.5 metres is provided in this structure, so that fishing and pleasure craft on the lake may have access to the Coorong from Lake Alexandrina. The total cost of the barrages was approximately $1.5 million dollars or 750,000 pounds. Please note: sizes on this page have been converted to metric from imperial and are approximate only.